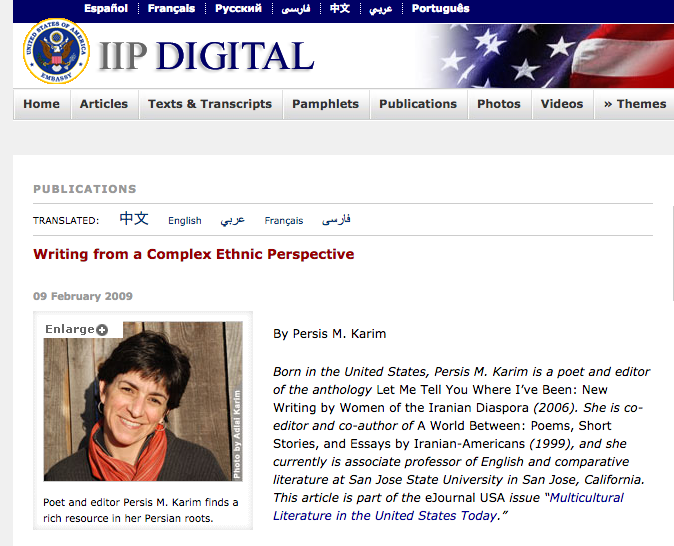 "Writing from a Complex Ethnic Identity" in Multicultural Literature in the United States Today, United States of America Embassy, 2009 | Persis Karim, Ph.D.Persis Karim, Ph.D. It has taken some time for American readers to appreciate the complexities, hardships, and beauty of the Iranian immigrant experience — and the body of literature that now describes that experience. A young but flourishing literature of the Iranian Diaspora has finally taken hold.